18 May is a special date for Alberto Pires. On that day, 12 years ago, his company, Mojito Bar Catering, was officially founded. 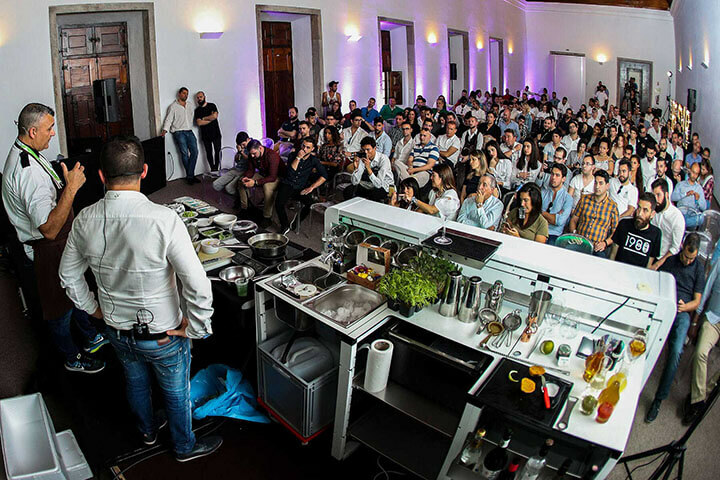 Seven years later on 18 May, he launched the first edition of the Lisbon Bar Show: a project that he had dreamed of for a long time, now the largest cocktail and spirit fair in Portugal, and the only event of its kind aimed chiefly at professionals from the sector. What Pires was not aware of was that destiny still had something else up its sleeve, as 18 May was also a significant date for the person who was to become his biggest backer for carrying out the project: Emanuel Minez. On 18 May, 12 years ago, his business career began with the opening of Cais da Praia and he is now the owner of the famous Red Frog in Lisbon, considered to be one of the best bars in the world. 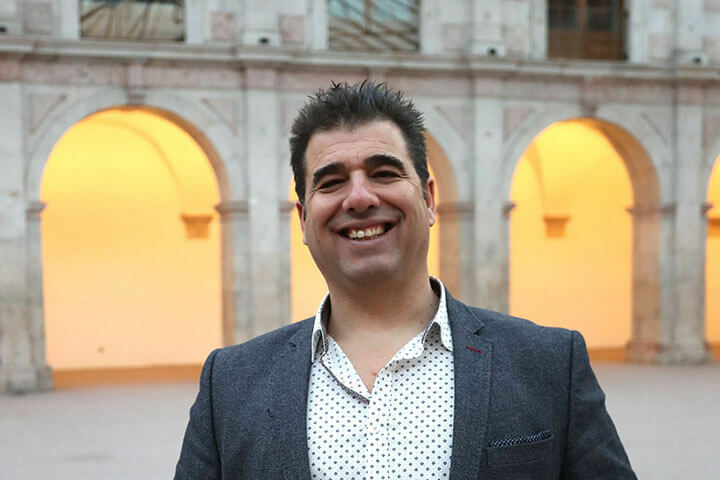 As a professional from the spirit world, Pires has traversed the world throughout his career visiting the sector’s most important fairs in London, Berlin, Madrid, Athens and more. The idea to start an event of this type occurred to him a long time ago, but it wasn’t until 2013 when it hit home that Portugal only had beverage and cocktail fairs aimed at the public. From then on, he wasn’t able to shake off the thought of creating an event made especially for baristas and bartenders in Portugal. 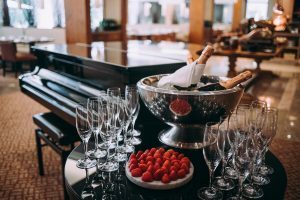 He took no time at all to get the ball rolling, studying a calendar for international spirit and cocktail fairs before deciding that May, just before summer, would be the perfect time to launch the event. The first edition was held on 18 May 2014. 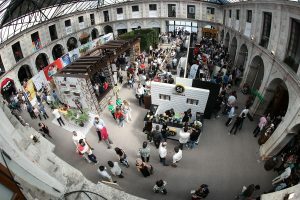 Five years later, Lisbon Bar Show has become not only the largest beverage and cocktail event in Portugal but one of the largest and most renowned in the world. “What makes me the proudest is that, since the first edition, LBS has been an international fair. It is held in Lisbon, but it could fit in perfectly in large cities such as London or New York,” says the event’s creator. Lisbon Bar Show began with the aim of introducing Portuguese visitors to global trends in the sector and highlighting the quality of Portuguese professionals, brands and beverages. The previous edition was attended by over 6,000 visitors and around 120 exhibitors, proving to be an excellent platform for sharing knowledge and bringing the most renowned names in the sector to Portugal. Year after year, the event gives professionals the opportunity to acquire skills, to be inspired and to learn about new techniques and trends alongside the very best. Lisbon Bar Show is a unique opportunity to meet specialists, brands, traders or simply those interested in the world of cocktails and spirits. 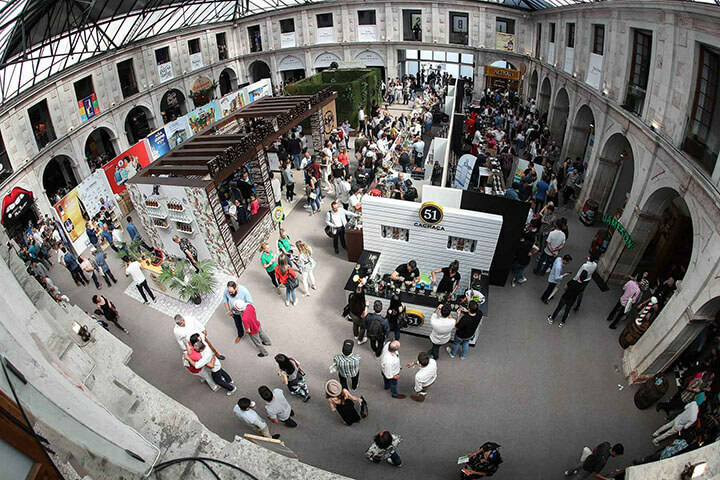 The 2019 edition of Lisbon Bar Show will be held on 14 and 15 May for the third year running at the famous Convento do Beato. The event also seeks to highlight the excellent quality of national produce and to acknowledge the immense value of Portuguese professionals. Over two days, attendees will be able to attend cutting-edge seminars and workshops. The previous edition of Lisbon Bar Show brought together professionals of such calibre as Simone Caporale, International Barman of the Year 2014; Erik Lorincz, head bartender of the Savoy (No. 1 on the list of the 50 best bars in the world); Philip Duff, director of education of Tales of the Cocktail; Carla Soares, from Atlas Bar in Singapore (named by World’s 50 Best Bars as one of the best in the world) and Marc Álvarez, one of the most renowned names in molecular mixology in Spain, among many more. Some of the biggest trailblazers in the Portuguese food scene also participated, such as the chefs Alexandre Silva, owner of Loco—the restaurant that opened in 2016 and which earned a Michelin star in the same year—and Leonel Pereira, from the acclaimed restaurant São Gabriel, holder of one Michelin star also. According to Pires, as soon as Lisbon Bar Show 2018 finished, the organisation began working on the forthcoming edition. “Our commitment for 2019 is based on continuing to improve all aspects of the event. We’re going to keep concentrating on bar professionals, which is why the fair is held mid-week and during working hours, although anyone with an interest in the world of spirits and cocktails is welcome at Lisbon Bar Show,” he says. To provide attendees with yet more surprises at the next edition of Lisbon Bar Show, Pires and his team travel around the world attending cocktail and spirit fairs throughout the year. That way, they expand their network of contacts and invite leading names from the sector to LBS. Each year the fair has a guest country, which last year was Spain, and in 2016 and 2017, Mexico and Italy respectively. However, the guest of honour for Lisbon Bar Show 2019 is yet to be revealed. 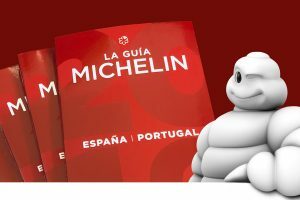 Once again the event will support and be a showcase for Portuguese haute cuisine with the participation of some of the best chefs in the country. 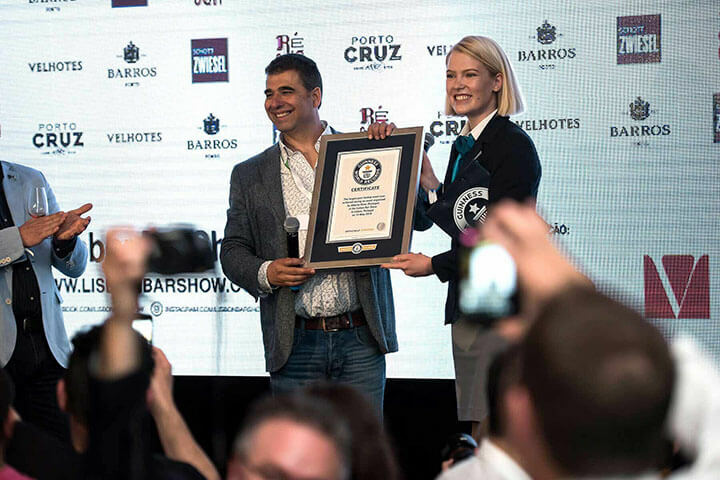 One interesting side note is that Lisbon Bar Show holds the Guinness World Record for “the largest Port wine tasting in the world,” which saw 293 people tasting four types of wine from said designation of origin. Given the enterprising nature of the fair’s founder, there’s no doubt that this is just one of many other records that LBS will achieve.